without poisoning the whole family or the planet! I had a call from a frustrated lady this morning, Betty in Ohio rang me to ask what in the world she could do to keep fleas and ticks off her two dogs without resorting to the chemical nuclear weapons her veterinarian was proposing. I was reminded of how difficult it is for pet owners who are trying to balance keeping nasty pests off their pets but are tired of having to resort to toxic products to do it. It has to be one of the most frustrating aspects of owning a dog, the struggle to keep your pet free of fleas and the other unpleasant insect invader that wants to make your dog’s fur his dwelling place, ticks, and now mosquitoes are another concern! Does the hapless pet-owner have no other choice than to use toxic products on the family pet who then distributes them innocently throughout your home? I don’t know about you, but putting drops on my dog’s coat that will kill insects who simply walk on her body (yikes!) doesn’t seem like a good idea for the long-term health of the pets I love, not to mention the unknown dangers of exposure to those chemicals are something I don’t want to expose myself & my two-footed family to either! Does that not worry anyone else out there? What about OUR reproductive systems or those of the children who play with the family pet? I’ve spent years researching ways to care for pets more naturally, looking for products that can help control insects and not cause long-term health problems for me OR my pets. A few hours of reading this evening brought a whole host of alarming new findings to view. “Avoid products that include synthetic neonicotinoids (like imidacloprid and dinotefuran), which are harmful to bees and may be toxic to the developing brain of young kids. Be wary of flea collars. These products can contain some of the most dangerous insecticides, including tetrachlorvinphos, carbaryl, and propoxur. For many years I worked as a veterinary technician in an animal hospital in the southeast. I cheerfully advised our clients to use whatever the latest pesticide laden guaranteed to annihilate those nasty bugs monthly flea drops or pills we had on the shelves. We routinely used organophosphate dips and shampoos to rid our client’s pets of whatever insects they might be harbouring. In those days of blissful ignorance, the mainstream veterinary establishment wholeheartedly endorsed the use of chemicals that I shudder to think of now. Every month the huge veterinary pharmaceutical manufacturers sent a veritable army of salesmen out. Their briefcases bulged with a vast array of glossy brochures and samples of vividly packaged chemical concoctions each with a more outlandish & frightening claim than the last. Years ago, I decided there had to be a safer way. Too many of my own pets developed cancers. At 8 years, then 6, then, unbelievably, at only 4 years of age. With a background in animal care and a growing interest nutrition and the use of more natural ways to care for my dogs, I determined that I would no longer use chemicals that I believed were going to harm my family or the pets I cared for. The good news is that advances have been made in the fight against fleas and ticks. Advances in the field of natural methods that finally are often even more effective than the rank and file of products that have been our only resort in the past. I don’t know about you, but I no longer have enough faith in the pharmaceutical community to take their assurances that these products don’t have profound adverse effects on the pets that I love or on my clients who I care about. Do your homework, be your pet’s advocate and be ready to accept that natural methods may take a bit more diligence and patience but are well worth the extra effort to protect not only your pet’s health, but yours and your family’s health too! What If Things Are Already Out Of Control? Meet Annie, the canine poster child for the first ever portable canine flea magnet. This little longhair Dachshund has made trying to be “flea free naturally” a goal for her owner but not necessarily a reality, yet! “I’d love to do flea control with Annie more naturally, but last year was just a nightmare!” said Liz, Annie’s owner. First of all, if there has been an infestation of fleas, going natural is possible but if things are completely out of hand it’s going to take diligent effort on your part. If you are reluctant or fearful of jumping off the chemical bandwagon all at once, you can go step by step and still make the transition albeit more gradually. Start Using Natural Flea Controls While Weaning Your Dog Off Chemical Ones. If you’re loathe to give up on the monthly drops, how about baby steps to helping your dog repel fleas on her own? Some owners use one application of their chemical alternative to get things under control, then implement safer controls in the 30 day period you’ve just borrowed with those drops. Use DeEarth to treat your yard and home. Start adding a natural flea repellent that’s safe to use at the same time as the chemical. Natural Flea Remedy is a great option. Let’s keep things simple please! A perfect example is making additions to your dog’s diet that can be implemented and safely used at the same time with flea drops or monthly treatments that your dogs takes in chewable or pill form. There is no magic bullet when it comes to natural solutions, but there are some pretty amazing new developments in way of natural flea control available today that do a very effective job at combating and safely eliminating fleas. Before you head to Amazon with a list of must-haves in your newfound zeal to make toxic flea control a thing of the past, the first place to begin is with your pet and his environment. Be Faster Than The Fleas! Start NOW if fleas have been a problem in the past. Don’t wait until you have an madly scratching dog or fleas taking up residence in the house to decide to take steps to make your home and your pets unsavory to the nasty little pests. Think like a flea! Look around your yard for your dog’s favorite spots to lounge. Fleas prefer cool moist dark spots and summertime dogs do as well, you can be sure the fleas will be laying wait for your dog to arrive. Use your natural flea products in those inviting areas to prevent fleas from setting up camp there. Most fleas are in your environment, not on your dog. The sad truth is for every flea you see there are typically 30 lurking in his bedding, cracks in the floor, your rugs etc. Your vacuum cleaner is a potent weapon against fleas when used the right way (every three days or you have a problem, daily). Use your washer to dispatch fleas and their eggs in doggie bedding or anything washable. Fleas quickly develop resistance to commercial flea controls, the beauty of natural options is that they stay effective for the long-term. Good old fashioned DEearth will go a long way in eradicating pests. Here’s a tutorial on using it & you can order the proper one here (you want food grade + organic!). Number 1 - Sweep The Pests & Their Eggs Away! Your new best friend in the fight against fleas is your trusty vacuum cleaner. Turn it into a flea fighting machine with a couple of quick steps use it often and use it thoroughly. If you have a flea problem already, then daily vacuuming is a powerful aid in eliminating the resident fleas and their eggs. Start with a new bag to ensure excellent air flow. Toss a cotton ball with a few drops of Pup Pup Cologne (or lavender and citrus oil) in the bag to eliminate the pests you incarcerate there. Vacuum your furniture, your floors & carpets, be relentless, fleas deposit their eggs in corners, rugs, cracks in the hardwood flooring (ick!) eliminate those hidden eggs and you’ll go far in keeping fleas off your dog too. Wash your pet’s bedding in the hottest water it will allow. Remember fleas love to hide and leave their eggs in moist dark places, eliminate them with a trip to the washer! Run a dehumidifier for two days in the problem areas. Keep the humidity under 50% (fleas can’t tolerate low humidity, it dehydrates them yay!) Vaccum again afterwards to remove the little caracsaes! Get a supply of flea traps they will help you know what the flea population in your house is REALLY like, and will help eliminate the little pests safely while you sleep. Use Baking Soda or Twenty Mule Team Borax to dehydrate the little beasts and bring about their natural demise. Try sprinkling them in problem areas, letting sit overnight then vacuuming away the remains the next day. Dirty dogs are flea magnets! Keeping your dog clean is an important step in keeping fleas at bay and ridding her of the pesky pests who may have already taken up residence. Fleas and more importantly, their eggs, must be removed not only from the premises but from your four-footed companions as well. Wondercide is a new company based in Texas, you might have seen them recently on Shark Tank. They offer a Flea & Tick Killing Shampoo Bar that is safe for you and your dogs and cats too. I believe they are committed to finding the most effective and safest ways to take care of pests in your environment as well with sprays for the yard, products to use in the house and body sprays that help kill and repel pests without the use of dangerous pesticides. I wish them much success with their products and from the feedback I’m seeing, they are quite effective. Check out their website here: Wondercide.com and their innovative & safe line of flea fighting products. They have options for inside and outside the house seem passionate about non-toxic pest control and have a complete line of safe options to help keep your home free of fleas. If you don’t have flea shampoo on hand PLEASE don’t reach for the DAWN!!! You can mix up this great smelling and quite effective alternative - the lemon juice adds limonene which kills fleas but is safe for people & dogs. ¼ Cup Dog Shampoo - Agatha’s Luxury Lather will work just fine. It has the added benefit of natural flea repelling lavender and bergamot essential oils along with soothing colloidal oatmeal and aloe. Shampoo your dog once weekly with a fresh batch for every session. I promise never to send you in search of products that don’t work, and if I enthusiastically review something it’s because I truly believe it will help make your life with your dog better in an important way. The real answer to natural flea control is to make your dog a walking flea repellant while using a minimum of external controls. 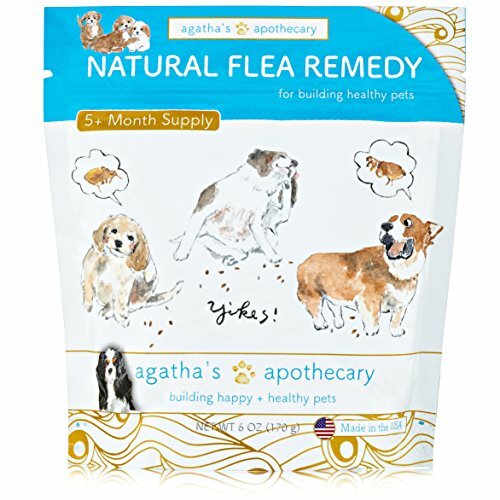 I’m excited about Agatha’s Natural Flea Remedy, contains a veritable smorgasbord of pest repelling, flea fighting, parasite eradicating amazingness in one tiny daily dose! With things like diatomaceous earth, beneficial low-dose garlic, brewers yeast, nucleotides, enzymes, kelp and more, fighting fleas just got a whole lot easier and healthier for your dog. Did you know that contrary to what your veterinarian says, garlic in small doses is very therapeutic and yes, beneficial for your pets? With some diligence on your part and the help of some naturally safe solutions, icky pests like fleas & ticks can become a thing of the past!